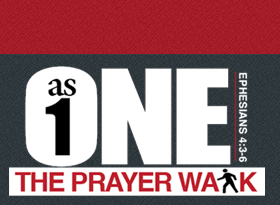 The As One Prayer Walk is made possible because of the generous support of churches, families, friends and Christian business leaders. We believe that God has all the money in the world and will supply every need to make His kingdom expand here on earth. If you believe in the vision of As One please consider making a Tax Deductible contribution. If you would like to join our team of sponsors please view the various options below or we can customize a package for you as well. You can make a secure online donation or send a check to AS ONE @ P.O. Box 45, Fayetteville, NC 28302-0045. If your church would like to become a sponsor we have different packages as well. THANK YOU FOR BELIEVING IN THE VISION!